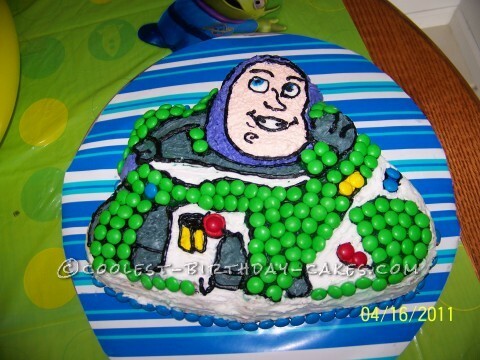 This Buzz Lightyear birthday cake was a fun cake to decorate. My son had a Buzz Lightyear party. I used a shaped-pan, something I don’t do often, but it is fun to do once in awhile. Instead of using frosting for every part of the cake, I used M&M’s, which gave it a more textured look, plus what kid doesn’t love M & M’s and the colors worked great. He thought this was the coolest cake ever.